The building’s layout – described as four structures under one roof canopy to create an “art village” – has no interior hallways, leaving plenty of open spaces for students to gather or work on their art. Those include a large terrace on the northeast corner of the second floor and a covered open-space area beckoning from the southeast corner, with the rustic oaks of the Wash only a stone’s throw away. Expect plenty of natural light: More than half of the exterior of the building will be glass. 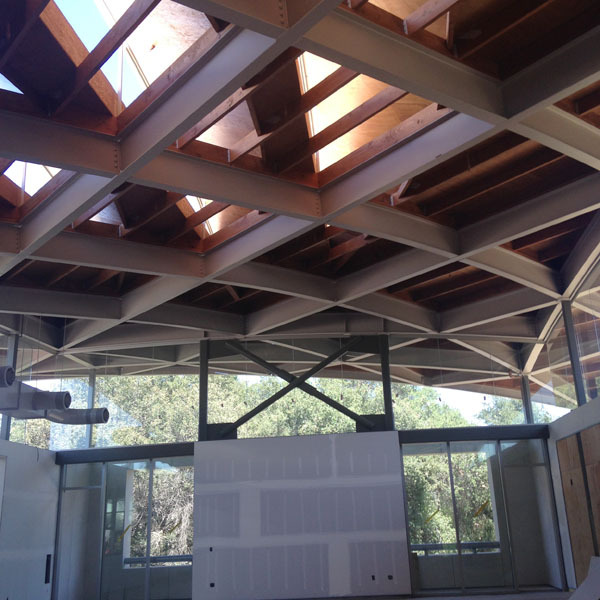 Upstairs, Professor Mercedes Texeido’s drawing studio will be lit with help from gill-like skylights (see photo.) The painting studio on the north side of the second floor looks out at a sweeping view of the San Gabriel Mountains. Along with spaces for painting, sculpture, drawing, metal work, a digital studio, a wood shop, photography, a computer lab and more, the building also includes a lounge with a kitchen, adjacent to the artist-in-residence space. The grounds of the large courtyard – another distinctive feature of the building — are starting to take shape. A cork oak has been planted, and faculty from both the art and geology departments have selected boulders that will be placed in the courtyard and used for both casual seating and for instruction by geology classes. The art-geology connection is just one example of the interdisciplinary aims behind the new building. One purpose for of the open-air gathering spaces is to allow students in different artistic disciplines to work side by side, and junior/senior studios also will be shared between disciplines. There could even be some unplanned interdisciplinary interaction between art and athletics: the balcony and terrace on the northern end of the upper floor offer a view into the outfield of Pomona’s baseball field.